APPEARANCE: Narigama are a tsukumogami of kama, iron kettles or cauldrons used to cook rice in old Japanese kitchens. They have long arms and legs. Their bodies are covered in dark hair as if wearing an animal’s pelt. Flames lick the sides of the kettle which either serves as their head, or which they wear like a helmet. BEHAVIOR: Little is known about the true nature of narigama, however a number of theories exist. They are often depicted cavorting with other tsukumogami in illustrations of the night parade of one hundred demons. INTERACTIONS: A narigama’s most amazing talent is the ability to predict the future. As its name suggest, it begins to emit sounds when it is heated over a fire. When the water inside begins to boil, a narigama will begin to ring or cry like an animal. Depending on the sound that it emits, it is possible to know whether the weather will be rainy or fair. An onmyōji or a priest can even divine good and bad fortunes based on the sounds the narigama makes as its contents are boiled. ORIGIN: Illustrations of narigama appear in some of the oldest hyakki yagyō emaki picture scrolls, although they appear without a name or description. Later, Toriyama Sekien included it in Hyakki tsurezure bukuro along with a brief history. According to Sekien, the narigama was first described in the Hakutaku zu, a record of all the supernatural creatures in the world describing their strengths and weaknesses. The entry in the Hakutaku zu explains that the narigama’s ability to to “ring” is connected to an ancient oni named Renjo. The Edo Period book Kansō kidan also describes Renjo as haunting kettles. According to this book, when a narigama begins acting up if you stand three shaku (about nintey centimeters) away from it and loudly say the name “Renjo,” the fires will descend into the earth, beneath the house. The haunting will end, and from then on the household will be blessed with good fortune. At the Kibitsu Shrine in Okayama Prefecture, priests still practice a folk ritual called narukama which involves boiling a kettle and examining the sounds it emits to predict good and bad fortunes. 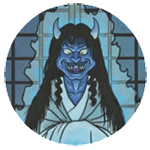 According to the Okayama tradition, the ritual’s powers derive not from Renjo, but from an ancient oni named Ura who long ago terrorized the region. Eventually Ura was slain, but even in death his head cried out nonstop. The flesh was eaten away to the bone by dogs, and still cries emitted from his empty skull. Ura’s head was buried beneath the shrine’s kitchen in order to silence it, but he could still be heard groaning beneath the kettles. Finally, a priestess named Aso hime offered a sacrifice of food to Ura’s restless spirit. This quieted him, and he changed his ways. 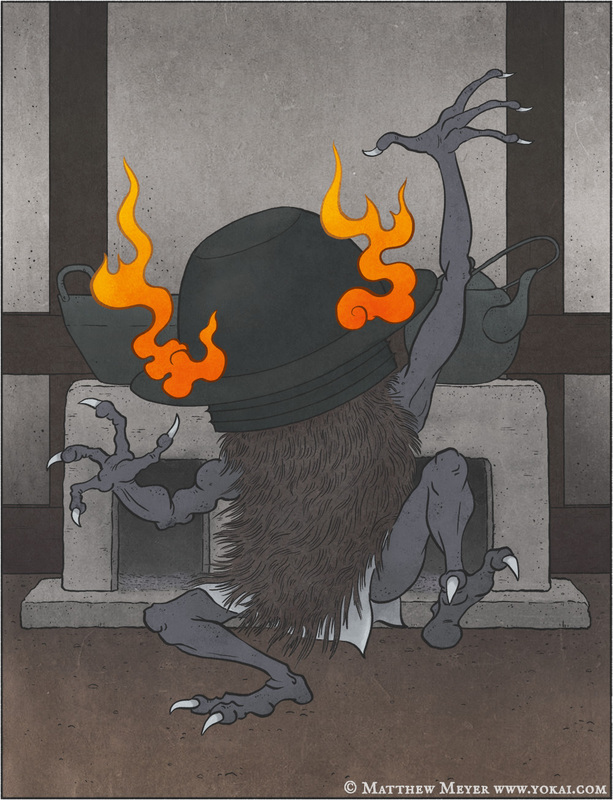 Since then, Ura’s spirit has used the crying kettle to foretell good and bad fortunes to the Kibitsu Shrine priests. Toriyama Sekien may have based his description on the narukama ritual, altering the history and connecting it to ancient China in order to make it seem more authentic.